The inaugural release for HWT was the 8 font system known as American Chromatic. 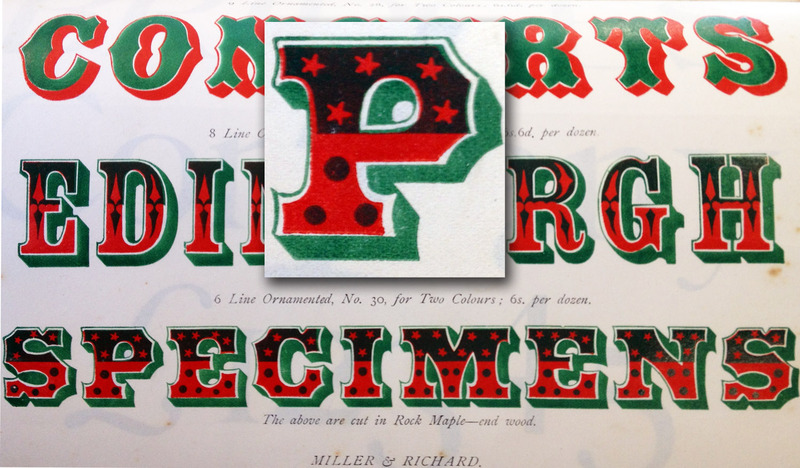 In our ongoing research for specimens, we have found some interesting variations of this highly decorative font. The first inspiration to make this type into a digital font was after seeing a box in a glass cabinet behind the counter at the Hamilton Museum. From there, it was a matter of having letterpress proofs pulled, finding the missing characters and determining how far to go with the character set and number of layers. Some specimens were found that determined what the second color in the chromatic should look like and eventually new layer options were added to make the set more flexible in terms of possible uses. Soon after the release of HWT American, additional variations of "drop shadowed, tuscan, outlined, half-filled, with stars inside" typefaces have been re-discovered. The style released by HWT was indeed unique to the Wm. Page Co. and first seen in their 1865 specimen book. The variation released by Morgans & Wilcox which varies mainly by not having stars in the lower half of each letter, was not seen until at least 1890. Around that time in England, the Miller & Richard company released their "Ornamental No. 30" which replaced the lower half star-fill with circles. A less direct imitation was released by Vanderburgh, Wells & Co circa 1889 with the name Republican. It is noticeably wider, yet still conceptualy almost identical. Not to be outdone by the competition, Page released their own variation of this quirky style called as per the naming conventions of most wood type styles of the day "No. 102". This 1887 release features inverted clovers in place of the top half of stars. Actual wood type of any of these oddball styles has yet to surface, but a larger sized font of the American Chromatic has recently been added to the collection at Columbia College Chicago. These will most likely not be made into digital fonts, but their existence is a tribute to the ongoing quest for ingenuity that wood type manufacturing allowed for. For practical reasons, these fonts were difficult to use in jobbing shops and are therefore quite rare. Let us know if you discover any examples of these fonts in use! Many blogs are receiving the American specimens online essays. All the details you must read about dissertation hq help assignment books. Then all our best review writers will know the best essay books.